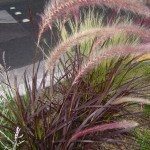 I have a client that would like to transplant 4 large purple fountain grass. They have not been cut back in some time and are extremely large. 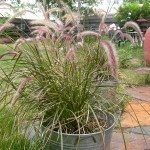 Cutting them back before transplanting would make them much easier to manage, due to their size, but how will that affect transplanting? Should I transplant them without pruning? Can I transplant now, or should I wait till spring? When should I prune and when should I transplant them?